A journey of 10,000 miles begins with a single step… or so the proverb goes. I for one prefer to think of it beginning with the push of a starter button and the raising of a kickstand. Either way, no matter how many steps you are taking, it is important that your feet are prepared for whatever adventures may come. To that end Fox Racing has you covered. 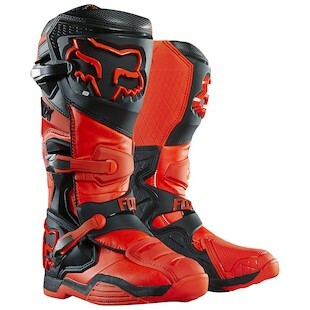 New for 2015 are the Fox Racing Comp 8 Boots. These have been designed to to fit between the Comp 5 and Instinct boots in the lineup as a mid-level option with a ton of top-tier features. With an already broken-in feel that allows for almost instant comfort, the controlled ankle support affords minimal bulk for a streamlined feel. The integrated rubber burn guard is sleekly utilized and offers great interaction with the foot controls on the bike. For solid protection against uncomfortable flexions of the foot, the Comp 8 Boots also come with an injection molded plastic shin plate, calf guard, and integrated steel shank in the midsole. At the same time, a premium foam ankle support system ensures that your foot does not slide around and remains firmly holstered within the boot’s defenses. Stepping into the upper echelon of off-road boots, the newest iteration of the Fox Racing Instinct Boots come to the show with an even more broken-in feel than the Comp 8s. In making use of the Duratec rubber compound, these boots also are at the top of the list when it comes to gripping the foot pegs. In addition, they further increase their functionality with features such as a low-ride chassis which puts the rider’s feet closer to the controls for more direct feedback. In looking at protective features, the Instinct Boots also employ hinge lockout stops that impede torsions of the joint that can lead to hyper extensions of the ankle/foot. While the Instinct Boots are not an entirely new entry to the Fox catalogue, the newest version has been refined to include slightly lower straps for comfort and ease as well as updated materials for durability over time. So don’t be afraid to take the step … that leads to your motorcycle … that will take you on a journey of many, many miles! 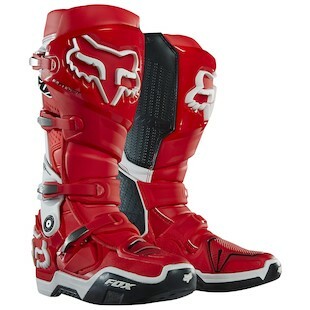 If any of those miles happen to be off-road, then reach for the new line of gear from Fox Racing and check out the Comp 8 or upgraded Instinct Boots.